Yoshi's Woolly World[a] is a side-scrolling platformer video game developed by Good-Feel and published by Nintendo for the Wii U. The game is the seventh main entry in the Yoshi series of games, the first home console title in the series since 1997's Yoshi's Story, as well as the spiritual successor to 2010's Kirby's Epic Yarn. The game was released worldwide throughout 2015. 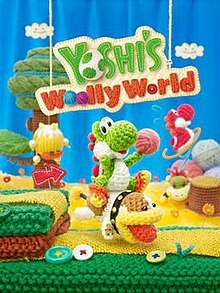 A port for the Nintendo 3DS, known as Poochy & Yoshi's Woolly World,[b] was released worldwide in early 2017. On a knitted island filled with many Yarn Yoshis of varying patterns, the evil Magikoopa Kamek turns nearly all the Yoshis into bundles of yarn for his master Baby Bowser, scattering them across different worlds. However, two Yoshis manage to avoid being transformed themselves, and they set off to pursue Kamek and rescue their woolly friends. After traveling through six different worlds, Yoshi manages to storm Baby Bowser's castle. When Yoshis reach Baby Bowser, Kamek reveals that he stole the yarn so that he could use it to grow Baby Bowser to a much larger size. After battling Baby Bowser, the Yoshis rescue their friends from Kamek and Baby Bowser. Kamek and Baby Bowser fly away, but crash land on the moon. E3 2014 screenshot of Yoshi's Woolly World. The characters and environment are depicted as living yarn knits, a theme that continues throughout the game. Yoshi's Woolly World is a platform game in which players assume the role of Yoshi. Similar to games like Good-Feel's Kirby's Epic Yarn, the game is set in a world where the characters and environment are composed of yarn and cloth. Yoshi retains much of his moveset from the Yoshi's Island series of games, including using his tongue to swallow enemies and using his flutter jump to reach high areas. Many elements such as flowers and mystery clouds also return. However, unlike other games where swallowing enemies would produce eggs which Yoshi could then throw, Yoshi instead produces balls of yarn. These yarn balls have various uses when thrown, such as tying up enemies or filling in certain platforms and objects. Players can also gather white chicks in certain levels, which produce temporary cloud platforms when thrown. The game also supports up to two players cooperatively. With both players able to swallow and throw their partners, allowing them to reach otherwise inaccessible areas. In addition, some sections give Yoshi special transformations, such as a motorbike or umbrella. Throughout each level, Yoshi can pick up beads, which can be spent on Power Badges. These can support the player during a level, such as granting more powerful attacks, or the ability to recover when falling into bottomless pits. Each level contains five Flowers, five Wonder Wools, and twenty Stamp Patches, which are hidden behind certain beads. Flowers increase the odds of entering a bonus game at the end of the level, and collecting all Flowers within a world opens up a secret level. Finding all the Yarn Bundles within a level unlocks a new pattern of Yoshi, which players can switch to while on the overworld map. Collecting enough Stamp Patches unlocks special stamps that can be used in Miiverse posts. At any point in the game, players can toggle between Classic Mode and Mellow Mode, the latter of which gives Yoshi a pair of wings, allowing less skilled players to fly indefinitely through a stage. The game features compatibility with Amiibo figures, including a unique knitted Yarn Yoshi Amiibo. Using any Yoshi Amiibo allows players to create a duplicate Yoshi during Solo Play, allowing solo players to replicate actions otherwise only available in Co-op Play. Additionally, the Yarn Yoshi Amiibo can be used to save a design based on another character. Other compatible figures, such as Mario and Donkey Kong, can be used to unlock additional patterns based on the respective character. The game is playable with the Wii U GamePad, Wii Remote, Wii Classic Controller, and Wii U Pro Controller. Yoshi's Woolly World was first announced by Nintendo CEO Satoru Iwata on January 23, 2013 under the tentative title Yarn Yoshi. The game was stated to be in development by Good-Feel with game designer Takashi Tezuka supervising the project. The game was absent from E3 2013, but was playable at E3 2014, where it was given a tentative release time frame of "the first half of 2015." The soundtrack was handled by Good-Feel composers Tomoya Tomita (now freelance) and Misaki Asada, with the exception of the main theme, which was written by Nintendo's Kazumi Totaka. Special editions of the game's retail release bundle the game with the knitted Yarn Yoshi Amiibo, which is available in one of three colors; green, blue, and pink. Bundles included the game with a single Yarn Yoshi Amiibo, or all three. Players who purchased the game on the European Nintendo eShop before July 23, 2015 received a free download code for a Virtual Console version of the Nintendo DS title Yoshi Touch & Go. Yoshi's Woolly World received generally positive reviews, receiving an aggregated score of 78/100 on Metacritic based on 83 reviews. GameSpot's Rob Crossley gave the game a score of 6/10, saying "Some would say that gives Woolly World its inherent accessibility, in that players aren't forced to take the hard road. But if you want to be fully entertained, the hard road is the only real option. It is your own degree of curiosity, and your compulsive nature, that will determine which route you'll take." IGN's Daniel Krupa gave the game a moderately positive review, saying "It's incredibly familiar, but the imaginative and attractive art style makes it feel fresh and appealing. Outside of those great few levels, Woolly World is a more forgettable and fragmented experience. Cool mechanics are cooked up, but they're dropped into levels which never realise their full potential and fixate more on unearthing frustrating collectibles." Nintendo Life's Thomas Whitehead stated that the game featured "some of Nintendo's best co-op platforming" with "clever, witty stage design" and "gorgeous" visuals, but found that boss fights were "repetitive and disappointing". The 3DS version received similarly positive reception, also receiving an aggregated score of 77/100 on Metacritic, based on 56 reviews. Reviewers applauded the port for being a successful transition of the original game to a handheld, though some complaints were raised over the visual downgrade and lack of local multiplayer, with Whitehead describing it as "certainly a pity if not entirely surprising". Yoshi's Woolly World launched in Japan with roughly 31,000 physical copies sold, and after two weeks, 43,000 copies were sold. In the UK, it entered the charts in fourth place. As of March 31, 2016, the game had worldwide sales of 1.37 million copies. The Nintendo 3DS version of the game sold 80 percent of its initial shipment in Japan, but only entered the UK charts in twentieth place. A stage based on the then-unreleased Yoshi's Woolly World appeared in Super Smash Bros. for Wii U. An upbeat remix of the music from the game's trailers is also present. ^ a b c McMahon, Conor (April 2, 2015). "Yoshi's Woolly World Knits Up Some Release Details And An Adorable Range Of amiibo". Nintendo Life. Archived from the original on April 2, 2015. Retrieved April 1, 2015. ^ "Yoshi's Woolly World". Nintendo Australia. Archived from the original on May 23, 2015. Retrieved May 22, 2015. ^ Nintendo Direct 2015.4.2 プレゼンテーション映像 [Nintendo Direct Presentation 2015.4.2] (in Japanese). Nintendo. April 1, 2015. Event occurs at 9:18. Retrieved May 22, 2015. ^ "Yoshi's Woolly World". Nintendo. July 26, 2014. ^ "Yoshi's Woolly World preview". Tuppence Magazine. July 21, 2014. ^ Parrish, Robin (June 14, 2014). "Can Amiibo toys make Nintendo matter again?". Tech Times. ^ McFerran, Damien (May 8, 2015). "You Don't Need A Yoshi amiibo To Unlock Stuff In Yoshi's Woolly World". Nintendo Life. Archived from the original on May 9, 2015. Retrieved May 8, 2015. ^ Crecente, Brian (January 23, 2013). "New Wii U Yoshi game coming from Nintendo". Polygon. Retrieved June 14, 2014. ^ "Yoshi's Wooly World for Wii U - Nintendo @ E3". E3.nintendo.com. June 11, 2014. Archived from the original on October 24, 2014. Retrieved June 11, 2014. ^ Hillard, Kyle (June 28, 2015). "The Charm Of Yarn And The Reception Of Yoshi's New Island With Woolly World's Producer". Retrieved June 30, 2015. ^ "Yoshi's Woolly World Amiibo Bundles Available for Pre-Order". IGN. ^ "In shops and on Nintendo eShop now: Yoshi's Woolly World". Nintendo of Europe GmbH. ^ a b "Yoshi's Woolly World (Wii U) Reviews". Metacritic. Retrieved October 19, 2015. ^ a b "Poochy & Yoshi's Woolly World (3DS) Reviews". Metacritic. Retrieved 8 December 2017. ^ Campbell, Spencer (October 12, 2015). "Yoshi's Woolly World review". Electronic Gaming Monthly. Retrieved October 12, 2015. ^ Hilliard, Kyle (October 12, 2015). "Yoshi's Best Solo Adventure In Two Decades - Yoshi's Woolly World - Wii U". Game Informer. Retrieved October 12, 2015. ^ Tamburro, Paul (July 9, 2015). "Yoshi's Woolly World Review". Game Revolution. Retrieved July 9, 2015. ^ a b Crossley, Rob (June 22, 2015). "Yoshi's Woolly World Review". GameSpot. Archived from the original on June 23, 2015. Retrieved June 22, 2015. ^ Bloodworth, Daniel (October 16, 2015). "Yoshi's Woolly World - Review". GameTrailers. Retrieved October 16, 2015. ^ a b Krupa, Daniel (June 22, 2015). "Yoshi's Woolly World Review". IGN. Retrieved June 22, 2015. ^ a b Whitehead, Thomas (June 22, 2015). "Yoshi's Woolly World Review". Nintendo Life. Retrieved June 22, 2015. ^ Orry, Tom (June 22, 2015). "Yoshi's Woolly World Review". VideoGamer.com. Retrieved June 22, 2015. ^ "Yoshi's Woolly World review". Nintendo World Report. Retrieved June 22, 2015. ^ Whitehead, Thomas. "Review: Poochy & Yoshi's Woolly World". Nintendo Life. Retrieved 5 February 2017. ^ Whitehead, Thomas (July 22, 2015). "Yoshi's Woolly World Has Limited Impact in Japan As Yo-Kai Watch Busters Dominates". Nintendo Life. Archived from the original on July 30, 2015. Retrieved July 30, 2015. ^ Whitehead, Thomas (July 29, 2015). "Yo-Kai Watch Busters and 3DS Continue to Rule in Japan". Nintendo Life. Archived from the original on July 30, 2015. Retrieved July 30, 2015. ^ Phillips, Tom (July 22, 2015). "Batman Arkham Knight perches atop UK chart". Nintendo Life. Archived from the original on September 5, 2015. ^ "Supplementary Information about Earnings Release" (PDF). Nintendo. April 27, 2016. p. 4. Retrieved April 27, 2016. ^ Yoshiller. "Poochy & Yoshi's Woolly World Sold 80% Of Its Initial Shipment In Japan". Go Nintendo. Retrieved 28 January 2017. ^ "Resident Evil 7 Remains Top". GfK Chart-Track. Retrieved 6 February 2017.